House Resolution 230 and Senate Resolution 112 condemn all forms of violence against children and youth while encouraging the development of a strategy for preventing, addressing, and ending violence against children and youth globally. Ask your representative to cosponsor this! Violence against children continues to be pervasive in its many forms including trafficking, child labor, child marriage, recruitment of child soldiers, and others. A whole-of-government strategy is desperately needed to address these issues. According to the Center for Disease Control, more than one billion children worldwide are exposed to violence in their homes, schools, and other places that are supposed to be safe. When violence goes unaddressed, it has the potential to delay children’s learning, negatively impact behavior, and can lead to health challenges across a lifespan. Violence against children also severely undermines other U.S. development efforts and foreign policy initiatives across the globe. Unaddressed violence can stunt the educational and economic growth of communities and nations, destabilize regions, and be a factor leading to increases in migration trends around the world. In schools, 246 million boys and girls experience gender-based violence, with girls at a higher risk of sexual violence, harassment, and exploitation. School-related gender-based violence is a major obstacle to ensuring girls’ access to quality education. Around the world, nearly one in three adolescent girls aged 15 to 19 have been a victim of violence. The Ending Violence Against Children Resolution also calls on Congress to recognize the economic consequences of violence against children and youth. The global economic impact of physical, psychological, and sexual violence against children may be as high as $7 trillion, or 8 percent of the world’s gross domestic product. The economic costs of child labor amount to between 2.4 and 6.6 percent of the world gross national income annually. To address these forms of violence, the World Health Organization, along with the Centers for Disease Control, the President’s Emergency Program for AIDS Relief, United States Agency for International Development, the World Bank, and others have developed INSPIRE, a package of evidence-based interventions to reduce rates of violence against children. This coordinated approach adopts common metrics and indicators that can be used by U.S. government agencies to monitor progress to prevent, address, and ultimately, end violence against children and youth globally. The resolution calls on the U.S. government to develop a whole-of-government strategy, adopting these evidence-based strategies, which are proven to prevent and address violence against children. In addition to the INSPIRE strategies, the resolution also calls on the U.S. government to create a common metric system for measuring success. There are currently many agencies and offices in the federal government that play a role in addressing violence against children. However, with their own systems in place for measuring results and tracking dollars spent on these programs, it can be difficult to have a clear picture of what the U.S. government is doing to collectively end violence against children in all its forms around the world. Now that this resolution has been introduced, World Vision and our partners in the Ending Violence Against Children Taskforce, need you to use your voice to encourage support from your member of Congress. It cannot be overstated how important it is for congressional offices to hear from their constituents regarding support for legislation and resolutions like this one. While our advocacy staff in Washington D.C. meets with congressional offices and impresses upon them the need to support this effort, the voice of their constituents on these matters is critical. 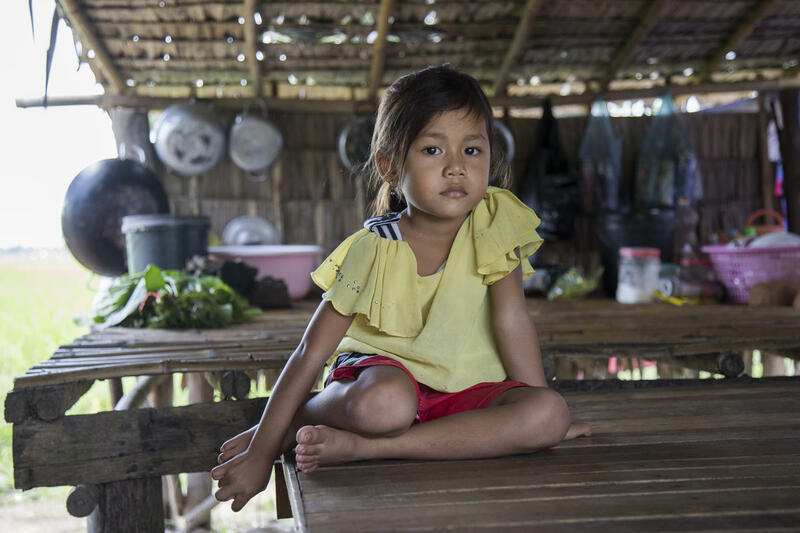 Photo: Chanpisey, 5, photographed at her home in Cambodia. Her father was in a gang and was not responsible with his two children and was violent with his wife while she was pregnant. But after he attended a “Celebrating Families” session run by a local church with the support of World Vision, he changed his behavior. ©World Vision 2017, Oscar Durand.